Optional Pre-Filter - An optional pre-filter is recommended for ice machine installations in areas with high particulate matter (dirty water). The pre-filter extends the filtration efficiency and working life of the primary filter cartridge where this condition exists. 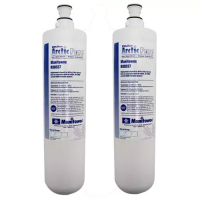 Pre-filter is a cost-efficient solution to the particulate matter (dirty water) problem because pre-filter replacements are more economical than a primary filter cartridge. Dimensions: 14- 1/2" x 3- 3/4" Dia.